Odd, then, that Sherman had a difficult and complicated relationship with his parents, rebelling against their assimilationist ways to become a pioneer of overtly-Jewish comedy, before falling prey to some of his family’s ghosts. Part of his story includes a Birmingham connection, where his father, Percy Coplon, was a rather unusual character. All of this is chronicled in “Overweight Sensation: The Life and Comedy of Allan Sherman,” a biography that was recently written by Mark Cohen. There were plenty of Jews in Hollywood, “but they didn’t perform as Jews,” he said. There was the immigrant mentality of becoming an American. “Ethnic groups, Jews in particular, were not keen on calling a great deal of attention to themselves” as having a separate identity. This was before Woody Allen, “Fiddler on the Roof” and Mel Brooks — and Jon Stewart was born just after Sherman’s first album was released. In 2003 Cohen contacted Warner Brothers to further his research. At the time, they were planning to release “My Son, the Box” and asked him to write the liner notes. He later did an article for an academic journal, then realized that the 50th anniversary of “Hello Muddah” was approaching in 2013. He kicked it into high gear to finish the book, which was released in May. Coplon came to the U.S. from Russia as a young child. His family wound up in Birmingham, in the automotive business. From a young age he raced cars at the Fairgrounds, and was involved in a spectacular wreck in October 1913 when his car went through the fence and he was knocked unconscious. Coplon said years later that two hours after being declared dead “I got up from an undertaking parlor in Birmingham and walked out,” but the Age-Herald from the time stated that after being treated in the infirmary he was up and about before the race ended. He was drafted into World War I and became an instructor at a training camp at the University of Alabama, then established an automotive company in Birmingham. It soon failed. In 1922 he moved to Chicago to be with his brother Abraham, who was a dentist — and into raw foods and nudism, among other unusual things. Abraham Coplon would have been at home in 1960s Berkeley, Cohen noted. In 1923, Coplon married Rose Sherman. Cohen noted that neither of them “had any attachment at all to Jewish life,” and Rose insisted that Coplon alter his last name to Copelon, making it seem less Jewish. Allan came along in 1924, growing up in Chicago until age 6. Due to family instability, he was moved around among Chicago, Los Angeles and New York, but in doing so “got exposed to the entire American Jewish scene” in big communities. His parents divorced in 1932 when Allan was seven years old, and Coplon returned to Birmingham. Allan saw his parents running from their identity, but “no matter how much dislocation he experienced, one thing was consistent — he found himself living with Jewish people.” And that was one of the few things in his life that he could count on. A year with his immigrant grandparents in his mid-teens solidified that identity. When he returned to his mother in California, she had married for a third time, and Allan had to take the last name Segal. As a high school senior, Allan took on his mother’s maiden name, “embracing all the things she was running away from,” Cohen said. He found comfort in Jewish things, while she felt embarrassment. 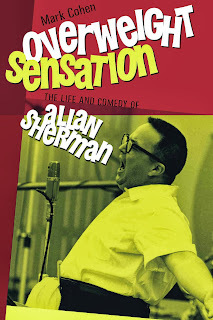 Allan went to the University of Illinois, writing satirical pieces under the name Allan Sherman. In 1942, his mother sent him to Birmingham to see his father — and to try and get money out of him. He arrived to find that his father, like his mother, had married again, also to someone not Jewish, and they had just adopted an eight-month-old girl. Nevertheless, Cohen quotes other relatives as saying Allan was welcomed “with open arms” by the rest of the family. He was given new clothes from Loveman’s, a tuxedo and a car. His father said he would help him with college expenses if he would go back to the family name, and when he returned to Illinois his columns had the byline of Allan Copelon. Briefly. Allan sent the columns to his father, but never heard from him. “My own father doesn’t care whether I live or die,” he later wrote, and reverted to Sherman. In 1949, he would find out about his father’s death in the newspaper. His pregnant wife was sitting on a bench in New York when she saw the article, and immediately called him. When he called his mother, she had just assumed he already knew. In August 1949, the 357-pound Percy Coplon embarked on a 100-day fast to shed 100 pounds, with his brother’s guidance. It was said that in the summer he would eat a dozen cantaloupes for breakfast, so to keep him from the temptation of food he would be in a shack at the top of a 30-foot flagpole the entire time, near his house in Tarrant. He planned to drink two gallons of water per day as his sole nourishment. Coplon was known as “five-by-five” for being five feet tall and five feet around. On the 92nd day, he came down and said he would finish the fast on the ground because of dizzy spells and failing eyesight. Though he was examined by a doctor and was said to be fine, a few hours later he collapsed in the bathroom and hit his head, and died less than an hour later. He was 53, and he had lost 102 pounds. Sherman went on to be a television writer. He created “I’ve Got a Secret” with Howard Merrill in 1952, but was fired from the show in 1958. In 1961, he was hired to rescue a game show, “You’re In The Picture,” which had one of the most atrocious debuts in television history, but before Sherman could do anything, host Jackie Gleason opened the second — and final — episode with an apology to the viewing public and cancelled the show himself. All those years, he kept writing song parodies, taking classic American tunes and throwing them into a Jewish world. In October 1962 “My Son, the Folk Singer” was released, and everyone expected it would sell in places like New York and Los Angeles — where Jews live — and nowhere else. But when it started selling big in Atlanta — which in the early 1960s had a Jewish population of just 14,500 and was years away from becoming a hub of Jewish life — everyone was taken by surprise. Within two months it had sold one million copies and was one of the fastest-selling albums to date. But his fame was short-lived, by 1968 his newer albums weren’t selling well and he was dropped from his label. He wrote “The Fig Leaves Are Falling,” which ran for only four nights on Broadway. He had issues with gambling and drinking, and like his father, with his weight. On Nov. 20, 1973, he had a heart attack in his apartment and died just short of his 49th birthday. In recent years, Sherman’s place in music history and Jewish history have been strengthened. The box set included the previously-rare parody of “My Fair Lady,” and with the “Mad Men” craze in recent years, all eight of his albums were re-released in 2010.